First, in case you haven't noticed already, I've got a new tab up top for book reviews! There are only a couple, but I'm going to go through my amazon reviews and add others as well! Second, I now have a personal Facebook page for Té Russ, so if you want to be my friend head on over to that page! With Mother's Day this weekend, I wanted to do something special for the mama's! So I will be having a raffle to give a way a box set of my first four books! Check out the giveaway tab at the top of the page and make sure to spread the word on Facebook and Twitter! Alright! Now let's get a little frisky! 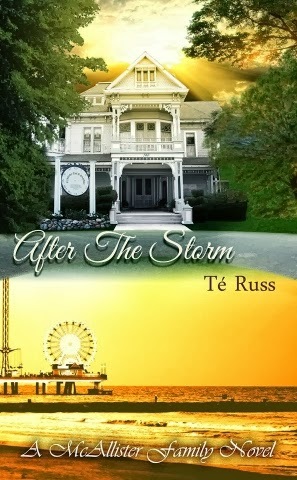 This week's excerpt comes from After the Storm. There's nothing quite like a first kiss, especially after having an emotional moment with someone. The tears were gone, but he kept stroking her face. Suddenly he stopped, but kept his hands on her face. She knew it was coming. She couldn't move. She felt his face inch closer to hers. She let out a wisp of breath, then his mouth slowly, covered hers. It was the gentlest kiss, but they both felt like their bodies exploded. She let out a sigh and he deepened the kiss. She slipped her arms around his neck to pull him closer and his control slipped just a little. He wrapped an arm around her waist and ran his other hand through her hair. Zach relished in the feel of Lila's body pressed against him. Her lips were the softest he'd ever felt, but they were torturing in the most sensual way. He knew he needed to pull away soon, but when she moaned into his mouth, he nearly lost all control. It was the ringing of his cell phone that broke the spell that they seemed to have fallen under. “You should get that,” she said against his mouth. His phone began ringing again. He gave her another quick, deep kiss then got up to answer his phone. Can't wait for another excerpt? Join me on Sunday with some great authors as we share our #SexySnippets! Only seven sentences, but oh so steamy! Interested in joining me to share your on #FriskyFriday excerpt? Click on the Frisky Friday tab at the top of the blog to join in! Have a great Mother's Day Weekend and don't forget to enter to win the box set of all of my books! There might be a surprise at the end!! What do i wish for mothers' day? I wish thst my mother rest peacefully as her last month on this earth was hard. I hope your mother is resting peacefully as well. My mom passed away 4 years ago. What do I wish for mothers' day? I wish all the mothers in the world to feel appreciated and loved! For Mother's Day I want a peaceful, relaxing, fun day with my family. I definitely want a peaceful fun day too! My family usually brings me breakfast in bed with gifts then my husband takes me out for something fun! Last year I went skydiving!